Gorilla Playsets Frontier Tree House with Amber Posts and Fort Add-On is a great addition to any backyard. The Deluxe Climbing Ramp is one of many ways to encourage good health. Their strength will be tested on the Rock Wall and the Deluxe Rope Ladder. This premium cedar wood playset is pre-cut, pre-sanded, pre-stained and ready to assemble in your backyard. The play deck is protected with a tongue and groove wood roof and includes an Upper-Level Tree House with working shutters. The entire playset is finished in our exclusive maintenance-free Timber Shield. 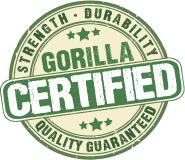 Gorilla Playsets cedar naturally resists rot, decay and insect damage.